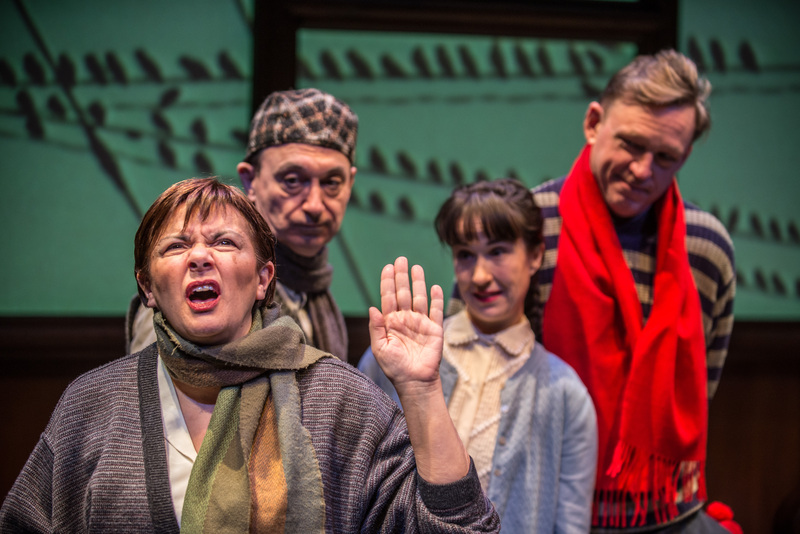 Possibly one of the most (if not the most) anticipated shows of the Great Canadian Theatre Company’s 41st season: Janet Irwin’s adaptation of Angel Square, written by Ottawa’s own Brian Doyle, takes the stage at the Irving Greenberg Centre until December 20th. While the piece is sure to deliver some warm fuzzies just in time for the Christmas holidays, it doesn’t quite have as strong an impact, emotionally or aesthetically, as one might have secretly (or not so secretly) hoped for. The question often arises, “to what degree are critics supposed to keep or discard their expectations when writing a review?” and although I think the answer is different for each critic (and for each show), in regards to Angel Square this was certainly a refreshing lesson on how one deals with the vexatious sense of anticipation. In a new initiative being set forth by the GCTC with the hopes of creating a more open and communicative relationship between Artist-Producer and the media, critics now have the opportunity to embed (to use the term very loosely) themselves a little further into a production. The idea is to open up an information highway, as it were, by supplying the reviewer with as many resources from which they can stimulate their writing. This includes the standard press releases and publicity photos and extends into supplying full copies of scripts (to be destroyed after using, of course) should the critic request it. Most importantly, though, is the decision to invite the media into the rehearsal room, allowing them a rare look at the process behind the product. By collapsing this traditional (but quickly becoming outdated) dichotomy, where artist and critic rest at opposite ends of the creative spectrum destined to never truly or actively interact with one another, it suggests that the GCTC is willing to recognize the ever changing field of theatre criticism and willing to support their theatre journalists both emerging and established, print or digital. Some critics believe that by bearing witness to any part of the rehearsal process it threatens a writer’s objectivity in their final review of a performance. I ask: if a critic (as opposed to the academic) is supposed to first react to a live performance first through their emotional (or what we might call phenomenological) responses, then how can we ever be truly objective (if such a thing even exists)? Further, I would argue that, embedded criticism, obviously depending on the degree to which the critic is embedded in the actual creative process, only creates a different set of expectations and anticipations then that of the critic who enters a performance having only done historical and/or background research and/or read the physical text. This is to say: creating expectations is a natural part of spectatorship and these expectations will necessarily differ depending on how you choose to inform yourself about that which you are going to spectate. Neither of these perspectives invalidates each other; they will, in fact, create a more colourful and significant discourse about the performance at hand. So, having attended Angel Square’s first(ish) script read-through and part of a technical rehearsal, how does this inform my review of the show itself? Well, first, to be frank, I set out with the intention of never watching a full run of the show before opening night because it was important to me that I try to maintain some of that sort of magic you feel when you watch something for the very first time. Secondly, I was interested in watching how director Irwin worked with her actors on stage and, lastly, how the stage itself would communicate the fictional world. The invited read-through of the script, I think, proved most beneficial to me as I was able to glean lots of fun tidbits about the production and the team working on it. While I was certainly able to grasp the text as a structural whole, through hearing the script vocalized by the actors, more importantly I gleaned the number of individuals working on the show who knew Doyle personally, whether they had worked with him previously or were taught by him growing up in Ottawa. This includes (but not limited to) performers Mary Ellis and Kristina Watt; set, lighting, and projection designer Jock Munro; and adaptor-director, Irwin, herself. What was even more intriguing about this event was that this wasn’t actually the first time the actors were sitting down and reading the script together. We were told that, at this point, the ensemble had been together with the text rehearsing for three days already. A decidedly refreshing change from the norm, where table reads can often be tricky (especially if it is the first time the ensemble is in a room together) to make very interesting, the GCTC turns it into a presentation of creative ideas and a sampling of artistic flavours for the critics to whet their appetites with. It was incredibly exciting to hear the text with the beginnings of its characters starting to take shape, and I found myself looking forward to seeing the performers’ voices embodied fully on stage and wondering how they would develop in a mere two weeks’ time. The initial designs of Jock Munro proved to be another source of great expectations as I listened avidly to how he detailed the giant antique radio that would use both projections and shadow play rather extensively to illustrate the scenic locations in the text as well as the radio plays that our protagonist Tommy re-enacts in his head. With Irwin and Munro having worked together previously on the critically–acclaimed adaptation of Doyle’s Up to Low, I had a lot of confidence in this team to bring about the same grassroots, nostalgic feelings and the same eye-catching aesthetics in Angel Square. 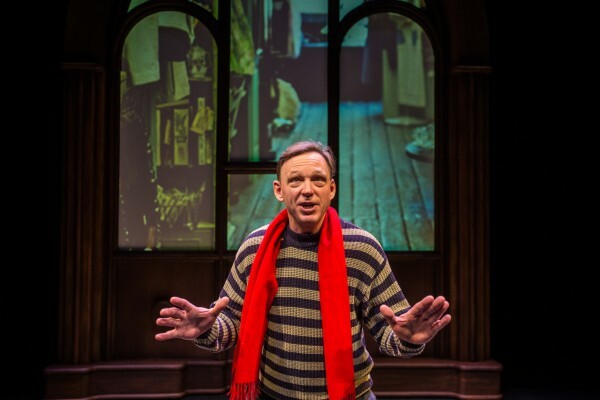 We also learned that this is not Irwin’s first time staging this piece, having done so at NAC in 2002-2003 with a much larger cast filling out the many roles required to represent the close-knit (but culturally divided) community of Lowertown in 1945. The decision to scale back to only four actors is a notable one, and I think it is safe to say that for the most part this ensemble communicates a number of their characters beautifully. However, I can’t help but feel that the compressed production schedule that most professional theatre houses run off of (i.e. a two-three week period after the production moves in to the theatre space during which the majority of the rehearsals and technical developments are done before the physical run of the show- all determined by Equity rules and regulations) wasn’t enough time to fully flesh out a lot of these figures and their relationships to one another. When I attended the technical rehearsal almost two weeks later and a few days from its grand opening, I was eager to see how things had developed from the first read and how Munro’s designs had been realized on stage. Understandably at this point there was a lot more stress and tension this time around, especially considering a critic was in the midst observing their work in what is usually seen as a most vulnerable state. Despite all that, I was still made to feel incredibly welcome in the rehearsal room and I was free to ask any kind of questions I felt might enhance or clarify what was happening on stage. Unfortunately, if I can attempt to pinpoint an exact moment, this is where my expectations began to falter.The stage was not at all like what I had expected (even though I had seen the model of it two weeks prior): where I anticipated something that encompassed more of the performance space and played with detail and nuance, we are presented with an obvious representation (complete with ‘volume’ and ‘tuning’ knobs) of an antique radio placed in the direct center of the upstage with no more than the space’s traditional black curtains surrounding it. The projections work nicely from a logistics standpoint and are a smart way to reference all the physical places dictated by the text. However, there were a number of the images which appear to have a grainy, or pixelated, quality to them (which becomes especially apparent if you are sitting in the front half of the audience) and it is unclear as to whether this is an active creative decision meant to reference the quality of photography at the time or something else entirely. In any case, there seems to be a lot more untapped potential for these projections to enhance the atmosphere in a given scene and really flesh out the world inside the radio. With the exception of Bruce Spinney who plays Tommy, the actors take on at least three different characters throughout the course of the play to try and colour the many different personalities and the cultural backgrounds that make up post-war Lowertown and the adolescent “battleground” that is Angel Square itself. 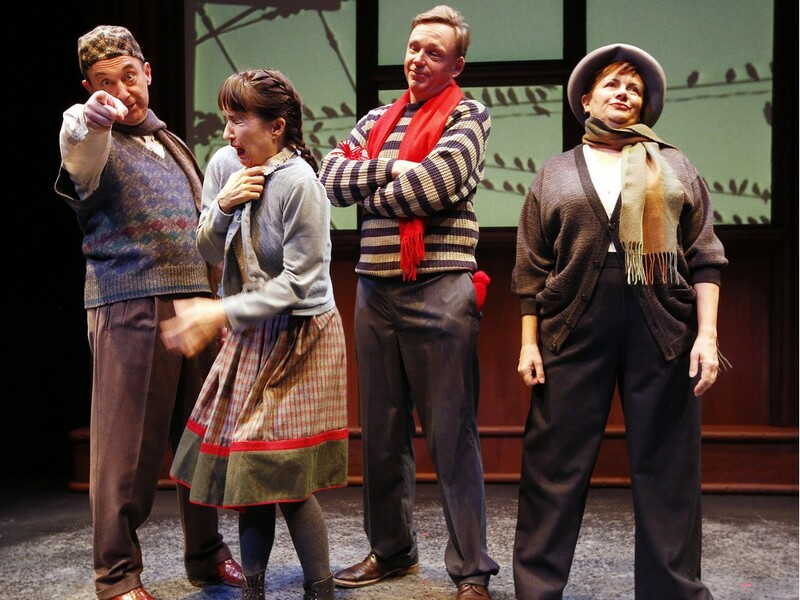 The characterization of some of the figures like the constantly exasperated teacher Mr. Blue Cheeks and slimy Mr. Log, both played by Robert Marinier, as well as the flirty Florette Featherstone Fitchey and the painfully confused Chalmers Lonnagin played by Kristina Watt, are memorable, distinct from one another, and certainly fun to watch on stage. 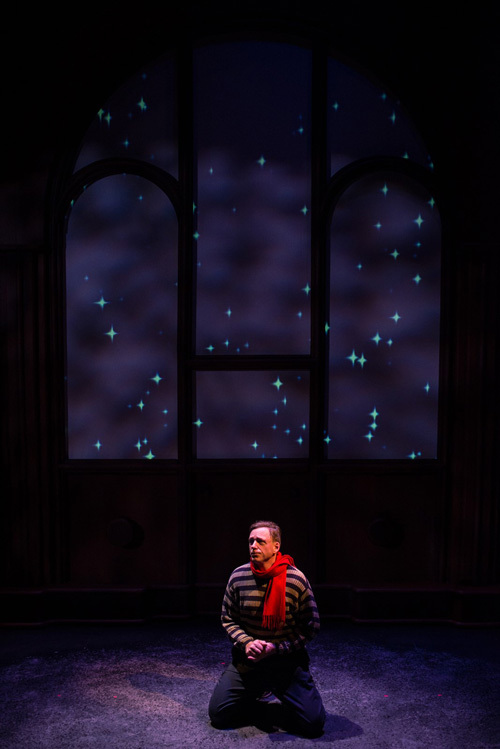 Spinney has some very beautiful moments as Tommy, too, with his voice radiating the innocence and the spirit of youth particularly in his call to God towards the end of the play. Nonetheless, I have difficulty finding the same sense of community in this show that was so apparent in Up to Low because it seems as though the relationships between Tommy and his three compatriots as well as with his family (i.e. his father, his Aunt Dottie, and his sister Pamela) are never fully illustrated. Perhaps this is caused by way of the smaller ensemble whereby each individual is playing the myriad of other characters on stage at any given time that building in more moments between Tommy and his best friends or his family members becomes difficult. I can understand the reasoning behind this decision, however, I found myself hoping for some more time between Tommy and his sister (played by Watt through some nice shadow work) and fellow musketeer Coco Laframboise- where the friendship between Gerald and Tommy seems to be firmly established, Coco and Tommy never get as much stage time. In the interest of transparency, my time ‘behind the scenes’ was limited (due to my own schedule, and not the fault of the company) so I am unable to comment on precisely how (or how much) director Irwin chooses to develop the interconnections and links between characters. Be that as it may, it was tough to find a lot of significance in characters like Aunt Dottie (played by Mary Ellis) and Tommy’s Dad (played by Marinier) when they seem to only appear onstage to argue about trivialities like whether an evening meal should be called ‘dinner’ or ‘supper’, without deeper investigation into the particular assigning of words and labels. In addition, somewhere along the way the decision was made to eliminate a scene where Tommy elaborates on the reasoning behind the gifts he gets for his Aunt and Dad each Christmas. This in turn makes the scene where Tommy, his dad, and his aunt unwrap their gifts slightly less meaningful because the audience is no longer given the tidbit that when Tommy’s father says, “Oh, it IS a flat fifty!” that’s what this character says every year with the same amount of enthusiasm and joy- solidifying the notion of Christmas spirit as tradition steeped in good family values. Ultimately, getting to witness some of the creation process behind Angel Square gave me a wholly different viewpoint on what professional theatre makers can do in a rather limited amount of time. The production is thoughtful and well acted, though I can’t help but wish they had even more development time because I created such high expectations for it from the first reading of the text. Is that wrong? It is, in any case, only one perspective and word around town is that this show is a must-see. It’s your last weekend to catch it, so get your tickets fast!